For many teenagers the world beyond home, school and a package holiday is a strange, hostile and lonely place - and they have no wish to explore it further. The computer screen is a more exciting and safer place to be. So how can young people find their own feet, use their initiative and create an independent life for themselves? Do fears over safety restrict the ability of young people (and we are talking about teenagers here) to explore the real, physical world, challenge their fears and feel at home in new places - with or without a mobile phone! Cyclecamp want to change that: we want to get young people to explore the world beyond their front door, to travel cheaply and independently and at the same time build physical confidence and a sense of independence. And young people now have the means to take up the challenge: mountain bikes are cheap and rugged, tents are cheap and light (festival goers leave them behind as disposable items) and Sustrans has created safer routes for young cyclists. This means that cycle camping is more accessible than ever to young people - what they might need is the encouragement of friends, parents and teachers. 1. Planning, preparation and forethought and setting realistic objectives. 2. The ability to see things through based on both realistic and imaginative inspiration. 4. Working together with other people to get results. 5. Route planning and map reading or using a navigational device. 6. Camping skills such as cooking, coping with wet weather and unfamiliar ground. 7. Understanding the distance and the effect of geography on a journey. 8. 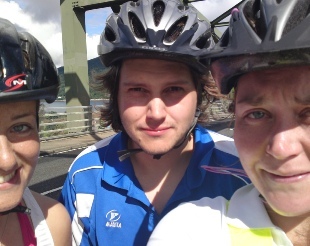 Dealing with the physical demands of a cycling trip that cannot be easily curtailed. 9. Problem solving of all kinds. 10. Awareness of the historical and cultural significance of the places they are passing through. Cycle camping also slots neatly into and enlivens the syllabus of several school subjects including geography, history, mechanics, engineering, art and physical education. Cyclecamp believes it’s better to get young people out of luxury caravans or package holiday hotels and into a world that they own, create and influence. We therefore want them to use our network of campsites and enjoy the satisfaction of achieving a challenging journey. As a teacher you may be interested in either taking a small group cycle camping or providing information and encouragement to those who want to do it in a group of their own. Either way it is a step towards getting young people to relate to the real world and increase their personal confidence in a way that might otherwise have eluded them. . 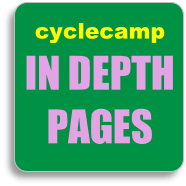 If you have any comments or views about cyclecamp or cycling camping generally please don’t hesitate to use the contact form on this page to get in touch. Want to raise any of the issues you’ve read about here? 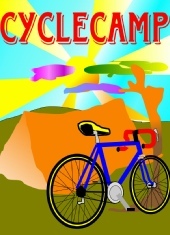 Why not see what other people think on the cyclecamp forum? Can cycle camping open up the wider world for teenagers?